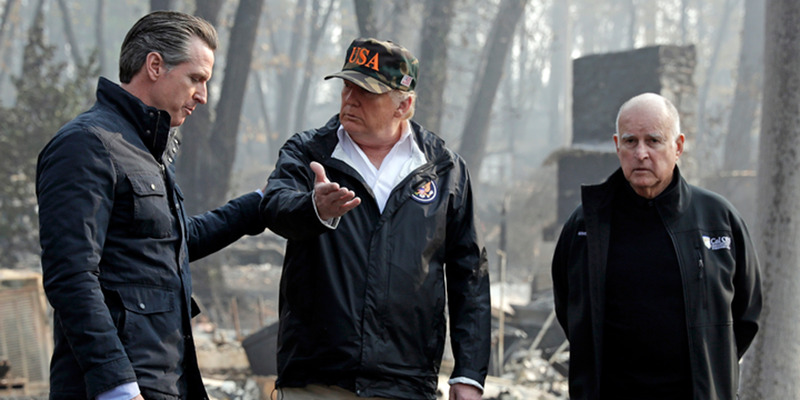 President Donald Trump talks with then-Gov.-elect Gavin Newsom, left, as California Gov. Jerry Brown listens during a visit to a neighborhood impacted by the Camp wildfire in Paradise, California, November 17, 2018. Nearly a month after the Supreme Court decided not to stand in the way of Trump's move to bar transgender people from serving in the military, the CalGuard's second-in-command told policymakers the rule would not be enforced on transgender troops serving in the CalGuard. California's newly elected Democratic governor Gavin Newsom also announced he would withdraw most of the roughly 360 California National Guardsmen currently deployed at the southern border to "focus on the actual threats facing the State of California." Around 110 troops at the US-Mexico border will be redeployed for "fire prevention and fire suppression efforts" as state authorities are believed to be nearing the end of the "decision-making process" for allocating assets for the upcoming fire season. A former senior CalGuard official told INSIDER on Monday the redeployment appears to be the right move. "In the end, I think National Guard troops are more suited, certainly for California, for things like wildfires," the official said. "It's when they're inundated with so many fires that all the firefighting capabilities in the state can't keep up with the [operational] tempo." "As long as you fight, we don't care what gender you identify as," Maj. Gen. Matthew Beevers, the California Military Department's assistant adjutant general, said to the Assembly Veterans Affairs Committee last week. "Nobody's going to kick you out," Beevers said, adding that transgender service members would still have to seek gender-reassignment surgery. Trump's ban has yet to be fully implemented, pending an injunction in place at the District Court of Maryland. US District Judge George Russell of Baltimore has yet to rule on the issue. Beevers said he expects the ban "will be lifted again." Trump initially announced he would reverse President Barack Obama's 2017 policy of allowing transgender people to serve. Trump said via tweet at the time that the military "cannot be burdened with the tremendous medical costs and disruption that transgender in the military would entail." 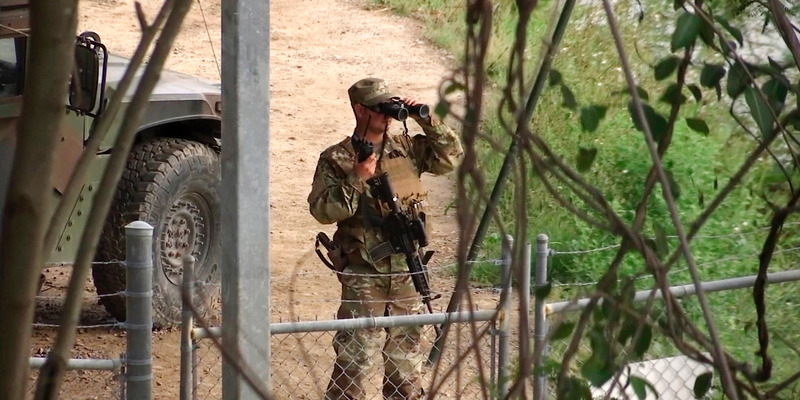 A National Guard soldier watches over Rio Grande River on the border in Roma, Texas, April 10, 2018. One year before Trump's announcement; however, a 2016 government-funded study found that "the costs of gender transition-related health care treatment are relatively low" for the 1,320 to 6,630 transgender troops on active duty. In its study, the Rand Corporation estimated a yearly cost of between $2.4 million and $8.4 million for gender-related surgical procedures, or about a 0.04% to 0.13% increase in health care costs for the active-duty military. It was unclear whether Gavin Newsom, California's newly elected Democratic governor who previously called Trump's ban "reckless" and "the height of cruelty and ignorance," played a role in the CalGuard's decision. "Military leaders, decorated veterans, and members of Congress from both parties have rightly come together to condemn what is - by the administration's own admission - a cheap, cynical ploy to rally the darkest corners of Trump's base against yet another invented domestic enemy," Newsom said in a statement after Trump's announcement. "There is NO basis to Trump's claim that the service of Patriotic transgender people impacts our military readiness," Newsom added. "On the contrary, the President today has weakened our military and by doing so, diminished both our security and our standing in the world community." A spokesman for the California Military Department told INSIDER that the CalGuard would continue to abide by federal regulations and directed all other inquiries to the governor's office. The governor's office did not respond to a request for comment on Monday evening. California Gov. Gavin Newsom during a Capitol news conference, February 11, 2019, in Sacramento, California. While the CalGuard's disagreement with Trump's policy may have been subtle, Newsom's views were not restrained. On Monday, Newsom made a move to undermine Trump's plan to deploy an additional 3,750 service members to guard the US-Mexico border, a development that would have brought the total number of service members there to around 6,000. 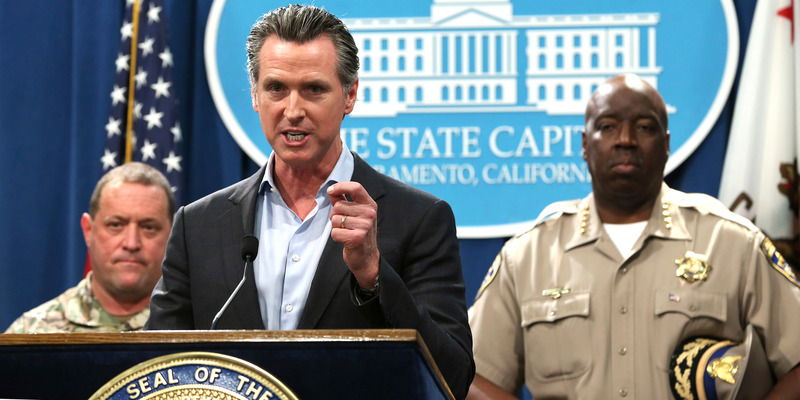 In a press conference with the state's National Guard and Highway Patrol chiefs, Newsom announced he would withdraw most of the roughly 360 California National Guardsmen currently deployed at the border to "focus on the actual threats facing the state." "The border 'emergency' is a manufactured crisis," Newsom said in a press conference Monday. "And California will not be part of this political theater. Which is why I have given the National Guard a new mission: They will refocus on the real threats facing our state." "This is our answer to the White House: No more division, xenophobia or nativism," Newsom said, adding that the troops who were withdrawn will be assigned other missions, such as supporting fire-prevention efforts and the state's Counterdrug Task Force. Around 110 troops from the border will be redeployed for "fire prevention and fire suppression efforts." About 100 troops are expected to continue conducting "counter narcotics search and seizure operations targeting transnational criminal organization around ports of entry." The California National Guard says it has deployed over 50,000 times since the 9/11 attacks, and responds to "an emergency incident" around once every three days in California. One former senior CalGuard official described the focus on California fire-prevention as "a good use of National Guard troops." State authorities are believed to be nearing the end of the "decision-making process" in allocating assets for the upcoming wildfire season after experiencing one of the deadliest fire seasons in the state's history. "In the end, I think National Guard troops are more suited, certainly for California, for things like wildfires," the former official said to INSIDER. "It's when they're inundated with so many fires that all the fire-fighting capabilities in the state can't keep up with the [operational] tempo."